That you are aware and accountable of the results you are getting. 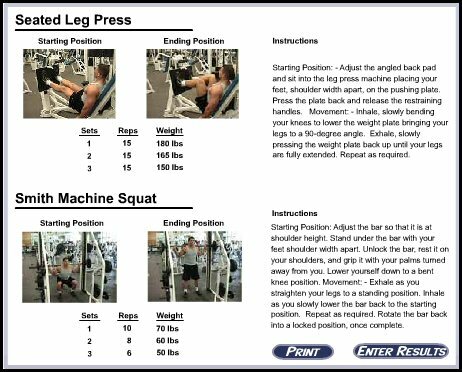 That the program can be updated and modified as you get stronger. First off, if you are doing any program with me I need to know what you can lift, bodyweight and otherwise. This is easily determined after the first workout and sets the precedent for improvement. You’ll find that some days you will be able to lift more, and this is a signal for improvement. Other times I may ask you try a particular weight, and it may be a little too much. The most important thing I ever learnt as a fitness instructor was that the small differences make big improvements. Secondly, you can end up over training. Believe me it's not uncommon for my clients (and you maybe next) to become completely hooked on exercise.You’ll want to train harder, do more and thoroughly enjoy the freedom of movement and spirit that exercising brings. The problem is, exercise releases chemicals called endorphins, and these make you feel really good. It’s also known as the exercise high – and it can lull you into a false sense of strength, the result of which is pushing too hard! This can cause over training, which can lead to negative returns. This is another reason I need feedback from you – adjusting the time and effort of your workouts and your days off is important, rest is crucial component of fitness. Thirdly – I want you to see the numbers go up. There is nothing more motivating and invigorating as success. I know you can achieve it, but I want you to see it. Making sure you keep track of your results is a valuable training tool, pushing you to constantly improve. It let’s you know where you stand, and more importantly it’s keeps you improving. Lastly, and you may think it strange, I know you are going to get stronger, fitter and firmer. But to make sure you keep getting stronger, firmer and fitter I need to know when to take you to the next level. Leaving Feedback for Your Trainer is important, but so is Nutrition; learn about the secrets of meal planning here.